When polymers are confined into one-dimensional (1-D) channels, they behave differently. Their dynamics changes, and they may chemically bind to the surrounding channel. A team of researchers led by Tomoki Ogoshi from Kanazawa University has now shown that such 1-D confinement, provided by a molecular crystal of so-called activated pillararenes, can be used to selectively capture different types of polymers. The scientists studied host–guest binding ('complexation') between activated pillararenes (abbreviated 'P5') and poly(ethylene oxide) polymers (abbreviated 'PEO'). P5 is a molecule consisting of 5 identical organic units featuring a benzene ring, with a pentagonal shape. The monomeric building block of PEO is O-CH2-CH2; PEOs with 100 or more monomers can easily be synthesized. The researchers then looked at what happened with a mixture of PEOs consisting of various numbers of monomers. The number of building blocks affects the weight—the more monomers, the heavier the polymer. Ogoshi and colleagues discovered that the heavier PEOs were taken up in larger quantities, showing that the P5 host can select PEOs with high mass fraction from a polydisperse mixture. By means of computer simulations, it was possible to attribute this finding to an increased binding energy for the larger (heavier) PEOs. The scientists also investigated the effect of the PEO's end group. The fastest PEO uptake was observed for methoxy end groups (O-CH3), for which an equilibrium state was reached after 3 minutes. For OH and NH2 end groups, the times to reach equilibrium were 10 and 20 minutes, respectively. Uptake for PEO with COOH as the end group was slow. The observation by Ogoshi and colleagues that P5 crystals can perform high mass fractionation from polymer mixtures with a broad molecular-weight distribution is important because, quoting the scientists, "high-molecular-weight polymers generally exhibit superior characteristics such as increased thermal stability, improved mechanical properties, and higher crystallinity compared with low-molecular-weight polymers." Pillar[n]arenes, collectively named pillararenes (and sometimes pillarenes), are cyclic organic molecules consisting of n so-called hydroquinone units, which can be substituted. Hydroquinone, also known as quinol, has the chemical formula C6H4(OH)2. It consists of a benzene ring with two hydroxyl (OH) groups bound to it at opposite sides of the benzene hexagon. 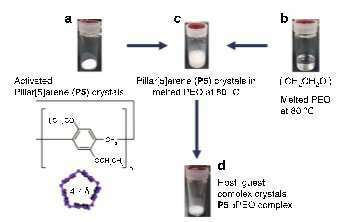 The first pillararene was synthesized in 2008 by Tomoki Ogoshi and colleagues from Kanazawa University. The name pillararene was chosen since the molecules are cylindrical (pillar-like) in shape and composed of aromatic moieties (arenes). Now, Ogoshi and colleagues have shown that crystals of n = 5 pillararenes can take up poly(ethylene oxide) polymers in a selective way. Poly(ethylene oxide) (PEO), also known as poly(ethylene glycol) (PEG) and polyoxyethylene (POE), is a polymer with formula H-(O-CH2-CH2)n-OH, with n the number of O-CH2-CH2 building blocks (monomers) in the structure. Ogoshi and colleagues have now shown that uptake by crystals of n = 5 pillararenes of PEO with higher n is larger than for PEO with lower n, which provides a molecular-weight fractionation function.